When I was hired by PoolSupplyWorld to manage their social media, the e-commerce company had 37 fans on Facebook. That was February 7, 2012. Less than one year later, the PoolSupplyWorld Facebook page has over 75,000 fans, thousands of repeat customers, and even won an award for Top 10 SMB Facebook Pages for 2012. As social media becomes increasingly important as a marketing channel, I am always searching for ways to increase fan and customer engagement. 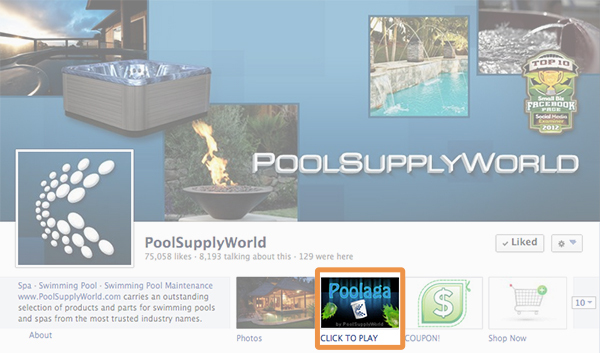 Recently, PoolSupplyWorld added social gaming to its social media arsenal. This post details the strategy behind our Facebook game, how we leverage open graph to drive virality, and a review of the metrics thus far. The co-manager of the page, Christian Carriger, built Poolaga using the Construct2 engine by Scirra. Constuct2 was great because it allowed us to create a custom-looking game without extensive coding. 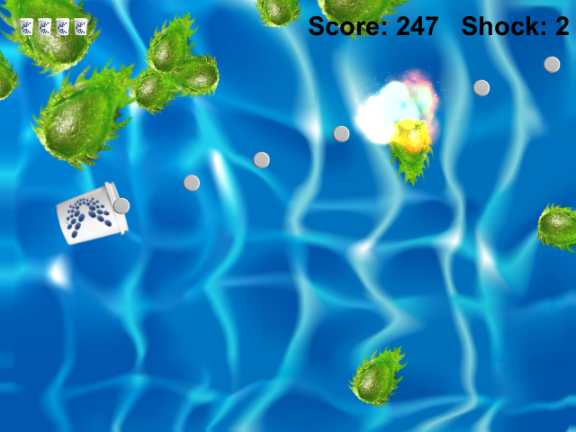 Poolaga, named as a tribute to the arcade classic Galaga, is a simple yet addictive game. Take control of a chlorine bucket and defend your pool from attacking algae! You can use the arrow keys or W-A-S-D to maneuver your bucket around the pool, and your mouse pointer to aim and shoot chlorine tabs at the attackers. If you get surrounded by too many baddies, you can right-click to ‘shock’ the pool, killing everything in your immediate area. Using chlorine tabs to fend off algae, or shocking your pool when you have an algae bloom are common occurrences for pool owners. We wanted to turn this otherwise mundane task into an exciting game that people want to play. To increase the chance of our game spreading virally, we built in a scorebord that communicated with open graph actions. When I finish playing a game, Poolaga will generate a Facebook post with my score (and offer to post it to my timeline). I can easily add text bragging about my achievements in the game. In addition to the Timeline post, Poolaga also creates a story in the ‘Recent Activity’ section of my Facebook profile. This story will actually pull and include the names of my Facebook friends whose high score I just beat. Although the stats are not staggering (yet), there are some interesting numbers. It is also worth noting that since the pool industry is seasonal, winter months are typically the lowest engagement for us. In November, we tested the game internally until we were sure it was working properly. 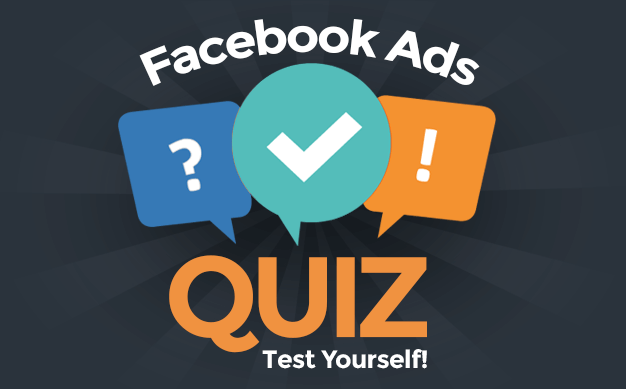 We added the game to our Facebook page, although at first it was not placed in the upper row. We told some friends and family about the game, and people slowly began to play it. On December 6th, we moved the tab icon to the upper row, and made a post about the game to our Facebook timeline. 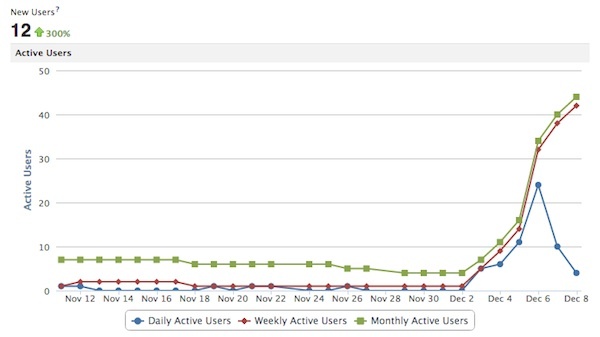 As you can see, the number of users jumped dramatically on that day. Throughout the entire month of December, we did not promote the game. We wanted to see what kind of organic growth the game received. 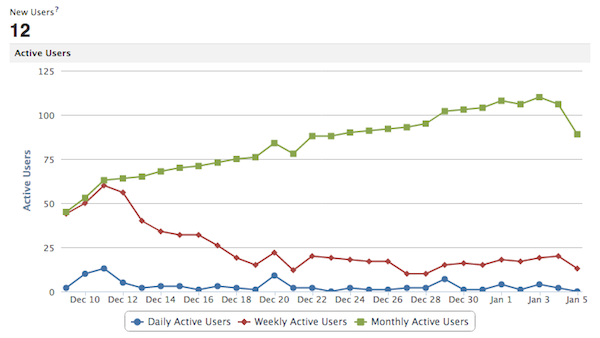 On January 10, our MAU peaked at 110 users. We then saw a decline in MAU, as the users added on December 6 began to drop off. Keep in mind a ‘month’ for Facebook insights is 28 days long. Since we clearly saw a boost in users when we posted about the game (24 daily users on Dec 6), we plan to post about the game once per week on our Facebook page. It will be interesting to watch user retention, and find out which PoolSupplyWorld fan is the Poolaga champion! Have you seen an example of a brand using games to increase engagement? Click HERE to play Poolaga and let me know what you think!